After that title, I bet you’re wondering if I have a game of business buzzword bingo up my sleeves for the day. Well, sorry to mislead you, but there’s something even better on tap. 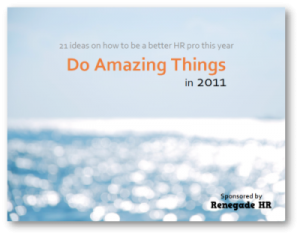 The 2011 version of the free Do Amazing Things eBook is here! There are 21 great, short stories and ideas to get your year moving in the right direction. I already made a copy for my manager and put it on her desk. Instead of trying to scarf it down in one sitting (which is easy to do! ), hold off and read one of them per day. Then try to find a way to do something different that day to align with what you’ve read. Whether it’s simplifying the way you work, looking deeper into your motivations, or innovating your way through a new process, try to make real, actual change in the way you do what you do. I’ve personally seen amazing results from that and hope you do as well. Click here to download Do Amazing Things in 2011 for free. Thanks to Chris for putting this together. His efforts are definitely appreciated! This entry was posted in General and tagged Chris Ferdinandi, eBook, Free Resources on January 24, 2011 by Ben. Ben – So glad you were in this year’s edition. Thanks again, dude! Thanks for posting the link, and nice contribution! I agree with your thoughts about emphasizing less about the “don’t do that” content and focusing more about the values, but wouldn’t a booklet holding the core vision, values and examples of the values in action still qualify as a handbook? The last employee handbook I helped put together really only had a couple pages of content (vision, company story, core values, examples of “awesome” actions) and then a lot of examples of the company culture. We included everything from comics our team laughed at, to team photos, to really great (and really bad) code snippets, to feedback from customers and partners. Rather than writing off the idea of a handbook entirely, I’d suggest that maybe we just need to update the concept of what belongs in such a tool. I’ve always been in the “get rid of the handbook” crowd, but Joseph’s approach is pretty cool. Great idea!